Founded in March 7, 1963, at the NIH campus in Bethesda, the NIH Radio Amateur Club has provided over a half century of voluntary public service, safety, and emergency-preparedness communications to the National Institutes of Health, and to local, regional, national and international communities. Membership in our Radio Amateur Club is open to anyone interested in the hobby. We conduct monthly in-person meetings in the Bethesda Campus of the National Institutes of Health (see below) the FIRST SATURDAY of every month at 1PM. We also hold on-the-air meetings, or radio nets, every Monday night at 9:00PM US Easter Time. Additionally, we participate in radio contests, and participate in and conduct a number of amateur radio activities. Meeting dates sometimes is changed in response to USA holidays or other special events. See our Home page for updated information. NIHRAC is affiliated with the National Institutes of Health, the primary U.S. Federal Government organization responsible for medical and behavioral research. NIH supports our club with facilities and equipment to promote the technical and professional development of our membership, enabling us to provide a higher level of service to our community and nation. NIHRAC is a federated entity, which means that different NIH installations (NIH has several across the country) can have their own amateur radio organization and choose to be affiliated with the NIH Radio Amateur Club. Currently, there is an affiliated club at the National Cancer Institute at Shady Grove in Maryland. NIH has other facilities at Frederick in Maryland, Research Triangle Park in North Carolina, and Rocky Mountain Labs in Montana, among other locations. If you are an NIH employee at an installation that does not have an amateur radio club yet, consider creating one--we can provide guidance. We are an integral part of the NIH Continuity of Operations Plan (COOP) and maintain a close working relationship with The NIH Clinical Center, the hospital on the Bethesda, MD campus. Because of this role, our Club facility is called the NIHRAC Volunteer Emergency Communications Facility (VECF). Our club participates in emergency preparedness exercises by providing communications at the hospital and other emergency preparedness events (for example, see this NIH Record article). We also collaborate with the National Library of Medicine on the Bethesda Hospital Emergency Preparedness Partnership (BHEPP), providing radio operating and engineering expertise for an emergency communications research and development project. See our NIH EmComm Support page for additional details. NIHRAC has a long standing affiliation with the Montgomery County, Maryland RACES/ARES, and the Maryland Emergency Management Agency (MEMA). The Club is also AMSAT Life Member Society #20 (since about 1970), and Club Sponsor of The Mid-Atlantic Repeater Council (T-MARC). We are also responsible for NIH's affiliation with Army-MARS. Club activities, including our official monthly meetings, are generally held at the NIHRAC facility located at the NIH Central Utility Plant in the center of the Bethesda campus, Building 11, Room 305. GPS coordinates: 38°59'54.6"N 77°06'11.1"W. See an interactive Google map in our Contact Us page. Bring a government-issued photo-ID to access the campus. NIH-badge holders can drive right through the security gates, but non-NIH-badge holders must obtain a visitor pass. Enter the campus via the NIH Commercial Vehicle Inspection Facility (CVIF) on Rockville Pike--Rt. 355--south of West Cedar Lane, or via NIH Gateway Dr. off Rockville Pike (find it center-right on the map below). On weekends, or weekdays after 6pm, visitors are free to park on regular parking spaces designated for NIH Parking Permit Holders. Please do not park on spaces that have other special reserved designations, unless you have the proper permit. There are several parking spaces right outside (West side) of building 11. 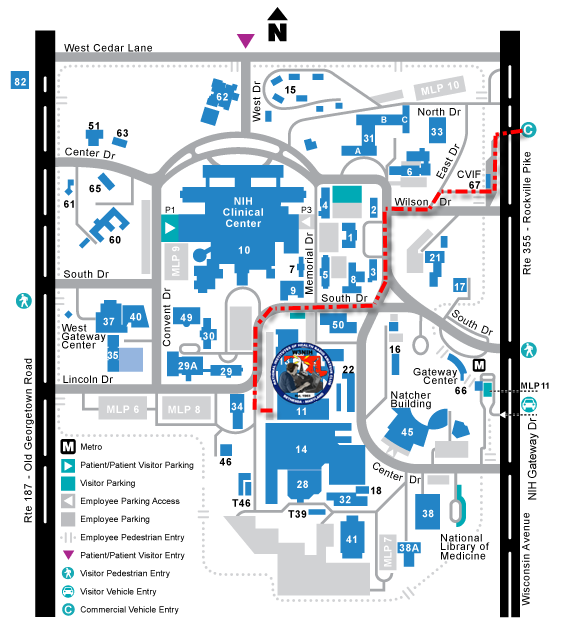 On weekdays, there are a few paid visitor parking locations on campus, but one common choice is MLP 11, accessible through NIH Gateway Dr. Consider letting us know in advance that you will be attending a meeting by sending an email to info@nihrac.org so that somebody can help you in the building. You can also use the intercom at the door to speak with security and explain that you are attending our amateur radio club meeting on the third floor (you would have to do the same again at another intercom just inside the building). If you carry a mobile or HT amateur radio, you can also call someone via our 2-meter repeater at 145.290 MHz--see our Repeaters page for updated information. The campus can be easily reached by metro and other public transportation. For more details about accessing the NIH campus in Bethesda, visit the NIH Visitor Information page. There is also a Google map available at our Contact Us page.